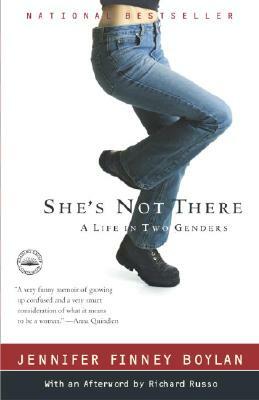 The provocative bestseller She’s Not There is the winning, utterly surprising story of a person changing genders. By turns hilarious and deeply moving, Jennifer Finney Boylan explores the territory that lies between men and women, examines changing friendships, and rejoices in the redeeming power of family. Told in Boylan’s fresh voice, She’s Not There is about a person bearing and finally revealing a complex secret. Through her clear eyes, She’s Not There provides a new window on the confounding process of accepting our true selves. “Probably no book I’ve read in recent years has made me so question my basic assumptions about both the centrality and the permeability of gender, and made me recognize myself in a situation I’ve never known and have never faced . . . The universality of the astonishingly uncommon: that’s the trick of She’s Not There. And with laughs, too. What a good book.” —Anna Quindlen, from the Introduction to the Book-of-the-Month-Club edition. JENNIFER FINNEY BOYLAN is co-chair of the English department at Colby College. As James Finney Boylan she wrote three critically praised novels and a collection of short stories. She lives in Maine with her family. "Beautifully crafted, fearless, painfully honest, inspiring and extremely witty. Jennifer Finney Boylan is an exquisite writer with a fascinating story and this combination has resulted in one of the most remarkable, moving and unforgettable memoirs in recent history." "In addition to being a complete delight, this book should make us all question what we mean when we use the words love, marriage, and friendship. Jennifer Finney Boylan is a great gift to womanhood."